Fall arrest safety netting or personnel safety nets is recognised by the UK Health & Safety Executive as their “preferred method of fall arrest when working at height”. 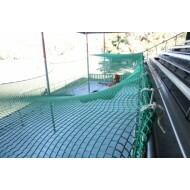 These nets are designed for working conditions at heights such as exposed suspension works (i.e. bridges), construction sites and warehouses. 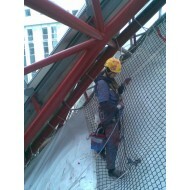 Fall arrest safety netting is used within the construction industry and a Certificate of Conformity is required. The purpose of safety netting is to arrest a persons’ fall by catching and absorbing the energy from the falling individual therefore reducing injuries or casualties. These types of nets have been proven to save lives. When used in conjunction with fine mesh netting, these nets are also effective at catching tools or debris. 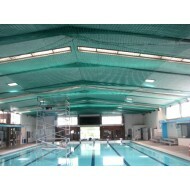 Safety nets represent a comprehensive safety solution and provide effective protection when installed correctly. By law, fall arrest netting must be present when there are workers working at height. The net should be positioned as close to workers as possible and ensuring a maximum fall height of 2m. Once the safety net has been used to arrest a fall, it must be replaced by a new net. All our nets have been manufactured to comply with the requirements of BS EN 1263:1 2002. A label is attached on the net to confirm this compliance, however every net must be maintained and routinely inspected when rigged and this must be conducted by a competent person. The nets must be checked for any damage, wear or rips, and the net must be discarded if any damage is noted. The net come with test patches which must be sent for an annual testing, which tests for UV degradation and not wear and tear. 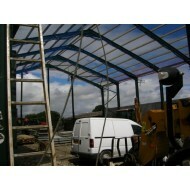 BS EN8411 -2007 A code of practice covering the use of safety nets, explaining how to use, select and specify safety nets.